Traditionally, sopapillas are a pastry dessert that consist of deep-fried dough that’s topped with sugar, honey, or a combination of both. Many people enjoy sopapillas around the holiday season, but they can be made any time of year. However, there are also some delicious and creative twists on traditional sopapilla recipes that we recommend giving a try, especially if you’re looking to wow your holiday guests with a unique dessert offering. 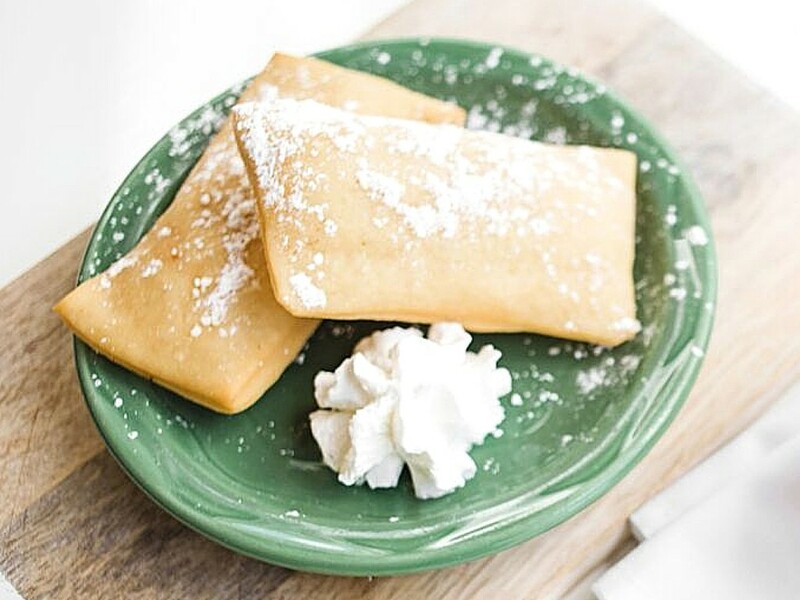 We’ve got plenty of creative sopapilla recipes for you below! Rather than traditional pumpkin pie this holiday season, why not serve up some yummy pumpkin sopapilla bars? These taste very similar to your favorite pumpkin pie, but have a creamier texture and are served up sopapilla style. For this recipe, all you need are crescent rolls, cream cheese, pumpkin puree, vanilla, butter, sugar, and a little bit of pumpkin pie spice. The end result is a cheesecake-like flavor with a hint of pumpkin and, of course, that delicious and flaky sopapilla crust! Speaking of cheesecake, can you really go wrong with combining the flaky crust of a sopapilla pastry with the creamy and rich texture of cheesecake? We don’t think so. This cheesecake sopapilla pie recipe takes dessert to the next level and is a must-try for anybody who loves dessert. This recipe incorporates Mexican vanilla extract, crescent roll dough, cream cheese, cinnamon, butter, honey, and sugar for a flavor that’s out of this world. You can also customize this recipe by adding your own toppings; for example, you could create a chocolate drizzle with Mexican chocolate and heavy cream. Or, you could keep things simple by adding some of your favorite cherry or strawberry fruit syrup on top. Either way, this cheesecake sopapilla pie is sure to be a hit with all your guests, and it’s not very difficult to make. Another excellent and unique sopapilla recipe to try out, especially this upcoming holiday season, is this cinnamon sugar sopapilla recipe. It’s just a minor diversion from traditional sopapillas, which are usually topped with honey and sugar. Instead, for a more “festive” flavor for Thanksgiving or Christmas, we recommend topping your flaky sopapillas with cinnamon sugar as described. Last but not least, consider surprising your guests by taking a totally new spin on the traditional sopapilla. Instead of serving them up as a dessert, try stuffing them with your favorite taco or burrito toppings instead. Seasoned ground beef, shredded chicken, cheese, beans, and rice are all great fillings for dinner sopapillas, and you’ll still get to enjoy that flaky and buttery crust. Check out this stuffed sopapilla recipe for more details. As you can see, there are some very creative ways in which you can transform the basic Mexican sopapilla into something totally unique and delicious. And none of these recipes are very difficult, even for beginners. So the next time you get a sweet tooth or have guests coming by for dinner, be sure to give one of these fun and different recipes a try in your own kitchen.